Arachnophobes May Pass - Ramblings of Mad Shutterbug & the Border Collie Bros. 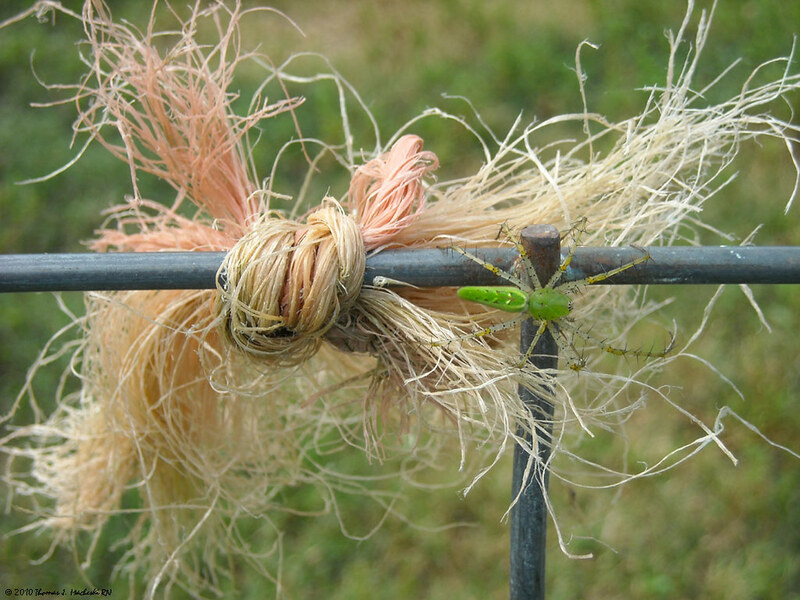 I reached toward that bit of old hay bale twine on the panel and stopped, because it moved. Looking closer I spied this wee fellow, and made their portrait. I'd say he, or her, or even zie, except I strongly suspect the gender of this wee fellow matters only to another wee fellow of the same genus. Tired today. Stiff, sore, after yesterday's Stay Late which lasted as long as usual. This week it is not even overtime, because the holiday on Monday means I've only worked 32 hours (plus the Stay Late) and not 40 hours. We don't receive overtime until we've worked 40 hours, even if we work greater than our normal shift hours in a row. On the other hand, I was off from Hospital on Wednesday, which was my holiday for working on Monday which was the holiday... are you confused yet? I suspect, personally, that's one of the attractions that the wee fellow felt for the specific location.